They come in a wide range of sizes and features with a full assortment of blinds available. Enhancing life with our most abundant natural resource light from above. 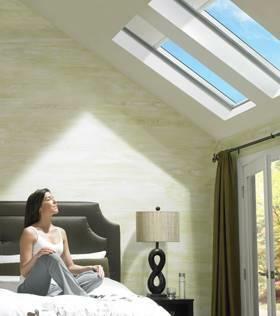 CLEAN: Features Neat glass coating to keep your skylight cleaner longer, leaving skylights virtually spotless. QUIET: Reduces unwanted outside noise by up to 25% less than a standard double pane glass, and up to 50% less than a plastic skylight. SAFE: VELUX recommends, and building codes require, laminated glass for out of reach applications. Complete this form to request a quote | A representative from Viking Roofing will respond within 24 hours. Thank you for contacting Viking Roofing , a representative will contact you shortly.